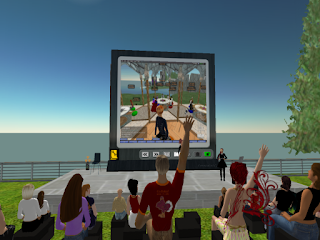 Maggie Marat (aka Peggy Sheehy in RL) gave a very informative presentation last night at the ISTE Skypark on her experiences in creating Ramapo Islands for the Suffern Middle School in Second Life. It's just amazing to me how good these presentations can be when the mode of communication is slides and chat. There is something about attending these events having all the avatars sitting around that makes it so much richer. I'm not sure why that is but it flat-out works. Second Life is so much fun! I hope the good folks at Suffern MS fully appreciate what a gem they have in Maggie Marat.